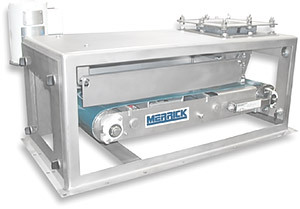 Model 960 | Weigh Belt Feeder | MERRICK Industries, Inc. The Model 960G is a general purpose belt feeder designed to gravimetrically meter chemicals into a process at an adjustable feedrate. The feeder belt speed is varied automatically to meter material into a process at a desired set point. Belt speed is determined by a MERRICK Genetix process controller by integrating the belt load with the belt speed. A gravimetric feeder is used for closed-loop process control. The Model 960V is a general purpose belt feeder designed to volumetrically meter chemicals into a process at an adjustable feedrate from 0-100%. Volumetric feedrate is achieved by varying the speed of the belt with a DC motor controller. The rate of speed can be adjusted either locally or remotely. In local mode, belt speed is set via a 0-100% potentiometer. In remote mode, the belt speed is set via a 4-20 mA signal isolator.